I'm not a Prophet…never have claimed to be one and don't desire that mantle. I do understand prophetic "ministry" and the prophetic office though. I do know that sometimes people speak out the words and insights of God in a "thus saith the Lord" kinda way. That's good and all of us who follow Jesus and live Kingdom lives need that. I've been the recipient of many prophetic "utterances" in books, conversations, and other means. I get that. It would be more appropriate to say here and now that prophets in the bible had little to do with predictive/fortune telling type of action than they did "reading the signs of the times" from a God-centered perspective. It doesn't always take some movement of God in your life to see where people's actions and activities are taking them. It is sometimes simple to be able to come to some conclusions on how a "train wreck" is approaching because you can see the "trains" out of control and on a collision course. So, that's where I'm heading today. After a 10 day period away from technology, I was able to jump back in with some renewed perspectives. First of all, I rebooted my great iPhone and immediately received the icon prompt of the many "comments" that I could view on Facebook. I did just that…and that's when it hit me – Facebook is going to "die" as a cultural phenomenon. Better yet, maybe its more accurate to say that it will go into some sort of "background noise" status in our culture. Why? For a couple of reasons – first of all, Facebook is the playground of the "unboundaried," voyeuristic, narcissistic, and lonely. More and more, I'm fascinated with how Facebook is being utilized by people to be impressed with themselves, or to air their insecurities or to publicly unload feelings and insipid activities in their lives that they believe the "world" cares about. I know that may be a bit harsh (in fact, it is harsh…yikes!) but you know it to be true. 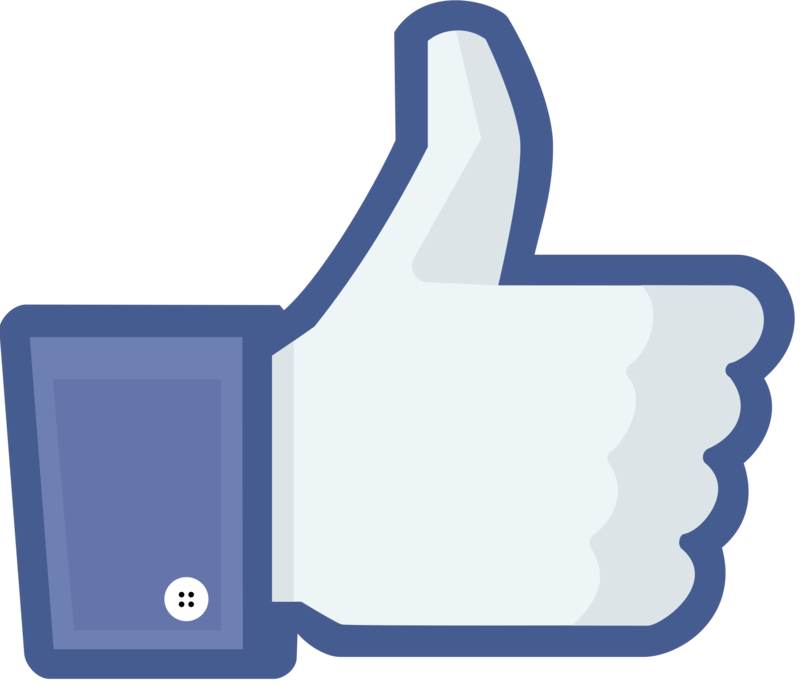 Put it this way – I'm embarrassed about some of the things I see on Facebook. TOO much public self-disclosure is inappropriate. In addition, people say and do things in public media that they would NEVER do in "person" which brings out the the potentiality (as most of us have seen) of creating more and more personas over time. What most people are doing on Facebook is relating to personas…in fact, it becomes more of a video game existence on Facebook as "avatars" relate with each other not the reality of life but a fantasy type of existence where characters vie for attention and recognition. I really believe that sane people are getting tired of that…I really do. Secondly, as one of my friends pointed out, people are not able to have real conversations on Facebook…the "freedom" that comes from typing out comments on a keyboard instead of looking at another person in the eye gives some a false sense of courage. It leads to people saying stupid, mean, and outright offensive remarks that doesn't promote relationship but actually tears it down. For example, one of my friends who often posts articles and comments from religious leaders around the world frequently gets "FB BLASTED" by others who berate and condemn just for the sake that they CAN within the Facebook context. You don't have to be patient with people on Facebook…you just verbally take your shot and move on. The vitriol that I often read coming out of responses to people's thoughtful remarks about world events, etc. is not only alarming but downright hateful. I believe that honest people who are looking for honest conversations about pertinent issues in our world will most likely take their conversations back to where they at least get a fair hearing. Lastly, advertising…I turned on my iPhone after my stretch of being away from technology. I looked at the Facebook comments and then went to my status update section to take a quick peek at people's comments only to find that I had to bypass every second or third post because it was an ad for an app or other type of service that was for sale. Facebook used to partition ads. Now it looks more and more that businesses and entrepreneurs are using social media for sales. I get that…but social media was intended more for relationships than branding and buying and selling. I believe people (I know I have) will and are getting tired of that reality on Facebook. When we are exposed to 1000's of ads a day in and through innumerable means, many of us will opt out of something that is more and more ad driven. For example, one of the reasons I dropped reading the newspaper is because of ads. I found that there was more print space dedicated to sales than to stories. The actual "news" in the newspaper would merit one or two pages. The rest…well, you know what I mean. So, there you go – over time, the sane will get tired of the insecure and narcissistic…people will desire what should be the standard in relationships, conversations about real life issues in real time, face to face encounters where there is some level of emotional accountability…and lastly, aren't we all tired of getting sold something? I'm tired of how consumerism has redefined life (but that's for another post). My conclusion, many of us will opt out of Facebook OR cut our involvement back and discover other means of communicating and connecting with cadres of acquaintances. That's my take…what say you? Darwin’s Doubt – If you have a “Scientific brain”, read it. If you don’t, read it anyway! Many of you know me and what I'm about to post should not come as a surprise. I'm NOT a scientist. In fact, my entire academic career and life's journey has been dedicated to what many would call the "humanities." My work and my interests lie in literature, music, philosophy, theology, missiology, practical theology, biblical study and the like. Truth is I didn't do too well in science classes. Call it a lack of interest or simply outside of my wiring pattern, scientific endeavors weren't my cup of tea. 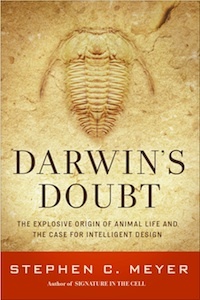 Which brings me to the question – why did I read Stephen Meyer's GREAT book, Darwin's Doubt. Here's the reason, pure and simple – the subject matter of this GREAT book (did I mention it was GREAT) is not only at the cutting edge of scientific conversation these days but is also at the crossroads of a clash in culture regarding worldviews. And THAT is what I'm very interested in. For those of you who are following the debate between science and "religion"…for those of you who feel like there are innumerable Jesus followers who purposely stick their heads in the sand regarding issues like those covered by Meyer's GREAT book…for those of you who are curious and fascinated by the growing conversation between religious communities and the scientific world…for those of you who have conversations and relationships with younger generations who have been exposed to a "naturalistic," "humanistic," "secularistic" worldview, this book is for you! What the book does is thoroughly explain, not just the history of the debate between Neo-Darwinism and those in the scientific community who have brought evidence and hypotheses to the table to refute, or at least, challenge what many people (including me) believe is cultural dogma, it also truthfully underscores the BIG issue – that being worldview and how worldview captures one's pre-assumptions and steers one's conclusions no matter what side of Darwinian fence they reside. I must admit, there were many, many parts of the book that simply went too far for me especially from a technical perspective. I'm not a chemist, paleontologist, biologist or genetic engineer. I can appreciate their stories and findings AND I can clearly see why Meyer wanted to clearly articulate his argument using highly technical language. Even so, Meyer does a great service to the reader by attempting to practically illustrate every scientific insight. I really enjoyed the pictures (in other words)! Yep, you read that right…there are great pictures in the book! What Meyer did though is give the reader a THOROUGH history of the scientific debate regarding Neo-Darwinian orthodoxy. Without being dogmatic, insulting, superficial or defensive, Meyer does what many theologians and pastors MUST do – he is patient with the conversation and approaches this debate with humility and forthrightness. I appreciated that! I've read other books that are hysterically ignorant or demeaning to anyone who doesn't adhere to their worldview and, even more importantly, purposely mix condemnation in with very little intellectual honesty. Meyer doesn't succumb to either. "For many scientists and scholars…a scientifically informed worldview was a materialistic worldview in which entities such as God, free will, mind, soul, and purpose play no role. Scientific materialism, following classical Darwinism, denied evidence of any design in nature and, therefore, any ultimate purpose to human existence." "…the case for design supports us in our existential confrontation with the void and the seeming meaninglessness of physical existence – the sense of survival for survival's sake that follows inexorably from a materialist worldview. Richard Dawkins and other New Atheists may find it untroubling, even amusing and certainly profitable, to muse over the prospect of a universe without purpose. But for a vast majority of thoughtful people, that idea is tinged with terror…the evidence of a purposeful deign behind life…offers the prospect of significance, wholeness and hope." You see, here's the rub…Neo-Darwinism at its core is a NON-theistic worldview. Non-theists attack any theory or even evidence of any "worldview" other than a materialistic worldview as religious naivety. Meyer states that the theory of intelligent design is not based upon religious belief nor does it provide PROOF of God's existence. It has faithful implications and potentially opens more dialog between intellectual communities. What DOES become important is how Neo-Darwinism has been dogmatically protected by some at the purposeful expense of ANY religious adherence and conversation. 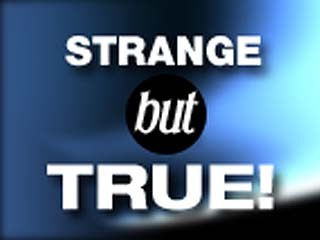 Just as it is wrong, in my view, to marginalize or mock those coming from a materialistic perspective, so it is just as damaging and hysterical to minimize the importance of honest evidence of an injection of "information" into the evolutionary process that may (remember this is a theory) be prime evidence for some "higher" intelligence in cosmological origins. I liked this book – I actually felt "smarter" for reading it. Of course, I also felt like an idiot at the same time! But the journey was well worth it. I enjoyed getting a bird's eye historical view of the scientific debate but, primarily, appreciated Meyer's ability to summarize the broader worldview issues at stake. Meyer summarizes the scientific debate well and provides a helpful worldview conversation that illumines a very pertinent topic in post-modern culture. Did I mention it is a GREAT book? 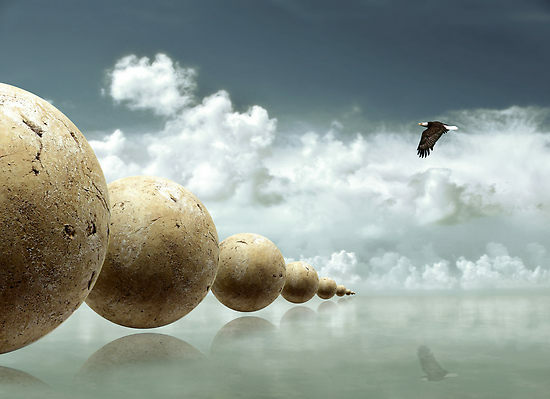 Yep, “The Cosmic Egg” might sound strange but it works! scripture but also give it a new sense of meaning. 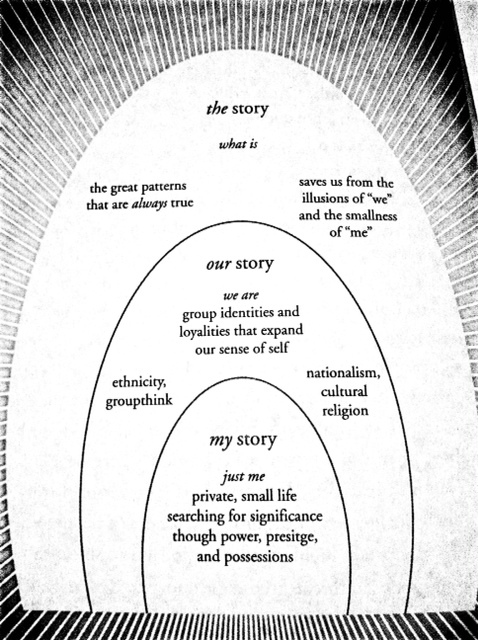 larger dome of meaning that encloses the first. their group, their religion, their occupation. My Story, Our Story and THE Story. appreciate, and with which I can agree. challenges me with a bigger world. more than anything or anyone else’s. truly find ourselves and God’s freedom, peace and purpose. know…a little heavy today but necessary deep waters to navigate. Things Hidden – Are you ready for the INFINITE? that holds on to purely what are senses can attain. gratification” what is there reaction? temporary satisfaction of an appetite. takes me back to the Rohr quote above. essentially related to something Infinite. its very essence) calls us into infinity. is driven not by finite appetites but for a yearning for eternity. but Jesus was saying MUCH, MUCH more. only exposed to a certain, select group. NOW, eternity was available to all.